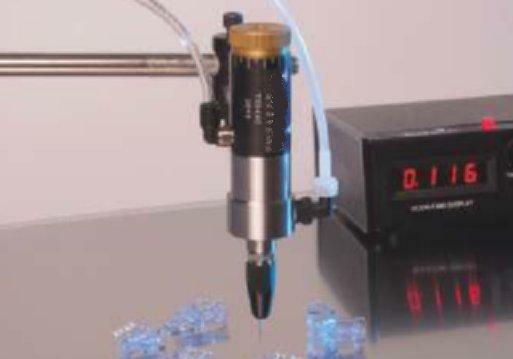 A controller dispenser is used to operate a time/ pressure valve by using a pneumatic timed pulse of high pressure air. This can be over 500 times per minute. With an auger valve, the controller sends a low voltage signal to operate it. Dispensers are supplied with user guide to assist with the initial setting up process. Customers can contact us for full support and advice in using this timed barrel dispensing station. Digital valve controller units provide function over all metering valves. From repeat micro deposits to continuous beads, controllers can be operated by foot switch or linked to a remote source, such as a PLC. We offer different controllers for use with dispense valves. Controllers for air operated single acting valves. Controllers for spray valves. And controllers for electric auger valves and PC pumps. Valves connect to the front of the controller using the supplied quick connect fittings. All controllers have an LCD display to show time settings and other information. Controllers have shot counters to display the number of deposits made over a given period. It is simple to connect these controllers to an external source, such as a PLC. by using the external I/O port connector. Summary: Digital pneumatic valve controller with LCD display. Foot switch or I/O control. Shot counter. Use with air operated valves TS1212, TS5620HU, TS5621HD, TS5622VT, TS5622VU, TS5622VD, TS5322, TS5322D, TS941, TS941A, TS934. Summary: Digital pneumatic valve controller with LCD display. Foot switch or I/O control. Shot counter, memory timer, teach mode. Use with air operated valves TS1212, TS5620HU, TS5621HD, TS5622VT, TS5622VU, TS5622VD, TS5322, TS5322D, TS941, TS941A, TS934. Summary: Digital pneumatic valve controller with LCD display. Foot switch control. Shot counter, memory timer, teach mode, self cycle. Use with air operated valves TS1212, TS5620HU, TS5621HD, TS5622VT, TS5622VU, TS5622VD, TS5322, TS5322D, TS941, TS941A, TS934. Summary: Digital pneumatic valve controller with LCD display. Foot switch or I/O control. Shot counter, memory timer, teach mode. Use with air operated valves TS1212, TS5620HU, TS5621HD, TS5622VT, TS5622VU, TS5622VD, TS5322, TS5322D, TS941, TS941A, TS934. Spray valves TS5520, TS5540. Auger valves TS5000DMP, TS7000. Summary: Digital pneumatic valve controller with LCD display. Foot switch or I/O control. Shot counter, memory timer, teach mode, touch screen, wifi, ethernet. Use with air operated valves TS1212, TS5620HU, TS5621HD, TS5622VT, TS5622VU, TS5622VD, TS5322, TS5322D, TS941, TS941A, TS934. Summary: Digital pneumatic valve controller with LCD display. Foot switch or I/O control. Shot counter, memory timer, teach mode, touch screen, wifi, ethernet. Use with spray valves TS5520, TTS5540-046R, TS5540-046F, TS5540-028R, TS5540-028F, TS5540-014R, TS5540-014F. Summary: Digital pneumatic valve controller with LCD display. Foot switch or I/O control. Shot counter, memory timer, teach mode, touch screen, wifi, ethernet. Use with motor driven auger valves TS5000DMP, TS7000 series. Summary: Digital pneumatic valve controller with LCD display. Foot switch or I/O control. Shot counter, memory timer, teach mode, touch screen, wifi, ethernet. Use with Techcon PC Pump positive displacement valves. Valve controllers require clean and dry compressed air from most small compressors, a mains factory air supply or nitrogen. We recommend the use of a 5 micron air filter on the supply air into the dispenser. This will reduce oil, moisture and particles from the air. Items are shipped by a courier on a tracked and insured service for all items that are available from stock. Items on a lead time will be shipped as soon as they are available. Valve controllers can be operated by foot switch provided or linked to a PLC or external signal for full automation. Select the valve controller that is compatible with the valve.